Its been over two years since we heard anything about Guillermo del Toro's new spin on the classic story of Pinocchio. The brilliant director revealed their collaboration on a stop-motion animated version of the story with The Jim Henson Company & Pathe back in 2008, but now Deadline reports the project is finally moving into production. Gris Grimly, who illustrated the 2002 take on the story, is directing with Mark Gustafson, and now we have a first look at a couple pieces of production art. 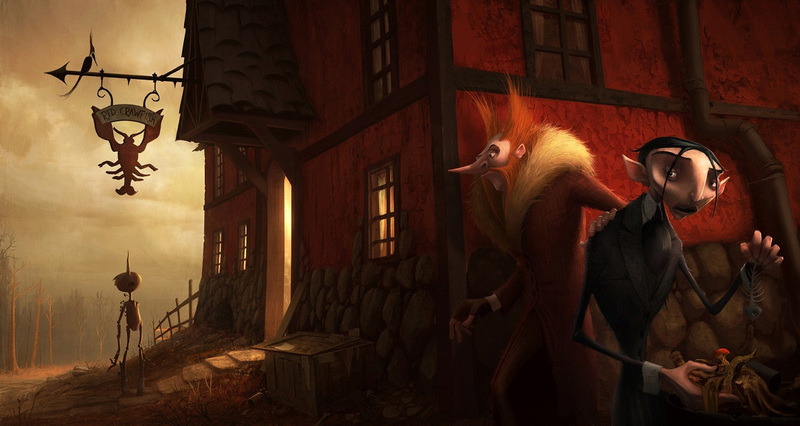 This is both loyal to the dark illustrations from Grimly's book and to del Toro's signature visual style. Check out some of the art below! “There has to be darkness in any fairy tale or children's narrative work, something the Brothers Grimm, Hans Christian Anderson and Walt Disney understood We tend to call something Disney-fied, but a lot of people forget how powerfully disturbing the best animated Disney movies are, including those kids being turned into donkeys in 'Pinocchio.' What we're trying to do is present a Pinocchio that is more faithful to the take that Colodi wrote. That is more surreal and slightly darker than what we've seen before. Yes, del Toro had originally imagined directing the project after working with Matthew Robbins, a writer who has also worked with the director on Mimic, Don't Be Afraid of the Dark and the forthcoming At the Mountains of Madness. However, with his work on Madness, he's just too busy, but he is confident that the team in place to bring the story to life is the right one. He says, “We've designed key frames and characters, we know the mood and the feel, we've created a bible. Shooting stop motion animation takes a lot time, but we've got the right team and I will be there for daily or weekly updates on how it's going." Sounds good! I could listen to GDT talk concepts all day. Fantastic! If I'm not mistaken though, Gris Grimly was the illustrator of the new take on Pinocchio, not the writer. 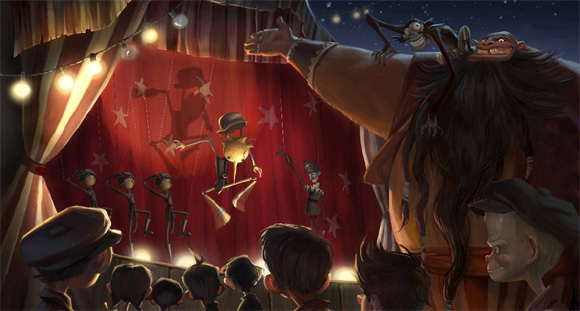 I am very excited to see Toro's visual style applied to Pinocchio. Awesome! I loved the stop motion part about the origin of the Golden Army in the beginning of Hellboy 2. Del Toro's creature design is always so intricate and well done; even his "bad guys" are creepily beautiful. Can't wait for this. 3-D? like the popping out of the screen 3-D? Yep, like immersing you in the world 3d, almost like you can touch it 3d, like you could pick up little Pinocchio and tickle his wee chin 3d. I know you'll be wearing yer glasses opening night Xerxex, he he. Will wait and see, I like that it actually uses colour quite well. nah, I'll see it in good old fashion 2-D.
Yep, good on you mister, I still haven't watched one yet either, can barely afford the price of a normal ticket. Del Toro is so awesome. He totally understands his projects and has a deep respect for anything he puts his hands on. This man should do a Roahl Dahl adaptation. His Charlie and the Chocolate Factory would have been breathtaking. Slightly creepier and darker? I remember Disney's Pinocchio scared the crap out of me when I first watched it as a little kid. Maybe kids these days are more de-sensitized?